Sometimes our job can be really hard. For example, we've spent the last couple of weeks gorging on sandwiches from all around town and deciding which are the best of the best. Here's a dozen we decided on, and we're sure you agree with every last one of them. But if you don't, feel free to let us know at backtalk@clclt.com. Or just excoriate us on social media, because that's what most folks would rather do anyway. 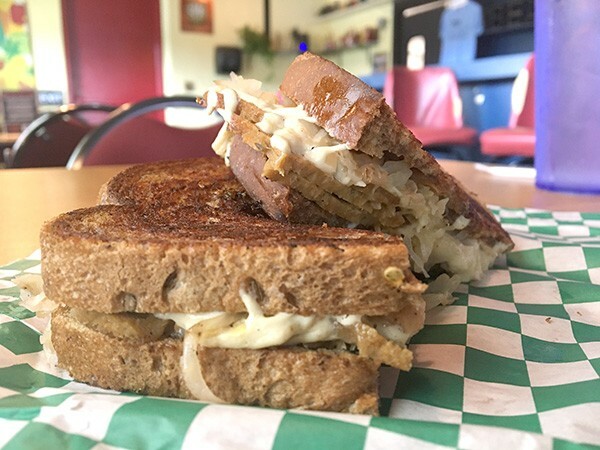 Fixins: House-made seitan lunch meat (beans, wheat gluten and spices cooked into a loaf and sliced); vegan mozzarella, sauerkraut and house-made 1000 Island on grilled rye. The Lowdown: Vegan chef Charlie Foesch never understood why vegan Reuben sandwiches were so ... un-Reuben-like. "After trying many different versions and variations of a vegan Reuben in many different cities," he says, "I couldn't find a traditional Reuben that used vegan ingredients." 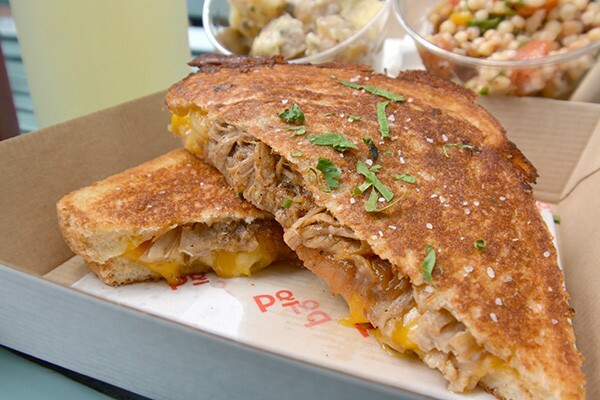 Foesch decided to come up with his own version, and his delicious, messy Reuben not only spawned Bean Vegan Cuisine, it's the restaurant's flagship sandwich. Goes Down Well With: The Tater Tot Casserole (Charlie's Aunt Gail's recipe, veganized) and an Olde Mecklenburg Copper or Lenny Boy kombucha to wash it all down. Location: 3001 East Independence Blvd. Hours: Mon.-Fri., 11:30 a.m.-9 p.m.; Sat., 10 a.m.-9 p.m.; Sun., 10 a.m.-8 p.m.
Fixins: Prosciutto, finocchiona, hot capocollo, mozzarella cheese, peppadew relish, house-made roasted tomato spread, fresh basil, Italian vinaigrette, pressed on a baguette. 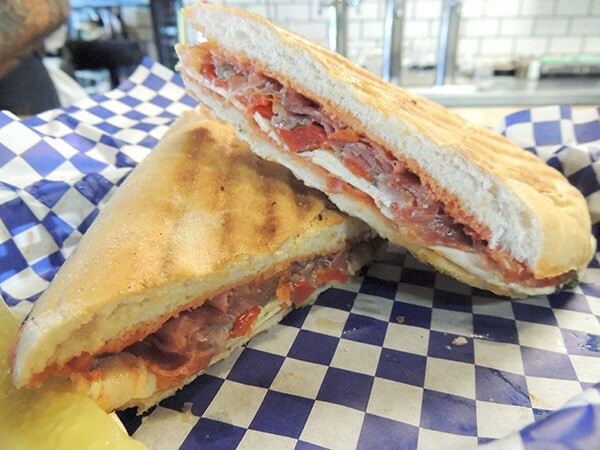 The Lowdown: NoDa Bodega owner Bryan Moore believes the Italian Stallion represents his bistro pub's efforts to take classics and put a fun twist on them. "You've got the salty prosciutto, the finocchiona is a little sweet, then you've got the hot capocollo, which gives it a little bit of spice," Moore says. "We're not trying to reinvent the wheel, we're trying to take something that's familiar to you and put a fun little spin on it." Goes Down Well With: Bodega's Redneck Potato Salad, made with potatoes, ranch dressing, cheddar cheese, bacon and scallops. Wash it down with a cold craft beer. Location: 1200 E. 36th St. 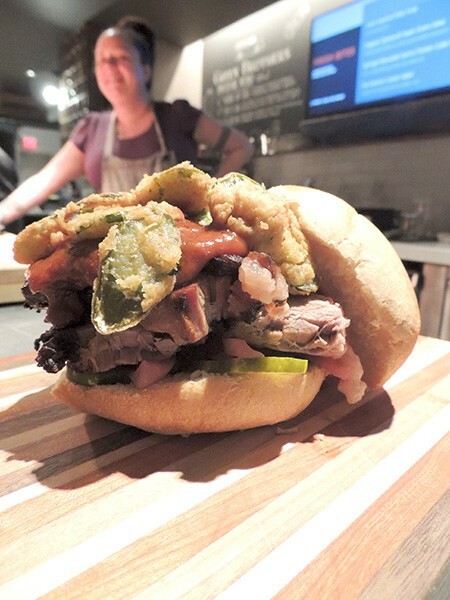 Hours: Mon.-Thu., 11 a.m.-8 p.m.; Friday, 8 a.m.-8 p.m.; Sat.-Sun., 8 a.m.-5 p.m.
Fixins: Brisket smoked for 12 hours, chipotle BBQ sauce, sweet pickles, pickled red onion, jalapenos, Lust Monk mustard. The Lowdown: Dominique "Dom" Chavez, a line cook who has taken over the sandwich operation, serves up a different special every day. We stopped by on a day when Chavez was serving her brisket, which she brines overnight, then smokes for 12 hours, then rubs down with "Dom's Love Rub," which is a mix of black pepper, mustard, cayenne pepper and brown sugar. They'll often post their specials on Instagram or Twitter, and if you like what you see, move quick. Location: 100 W. Trade St. Hours: Mon-Fri: Sandwiches go on sale at 11 a.m., and Chavez makes them until she runs out of ingredients (usually by 2). Fixins: Baked and sliced tofu, baby spinach, red bell peppers, cucumbers, carrots, tomato and onion (vegan). 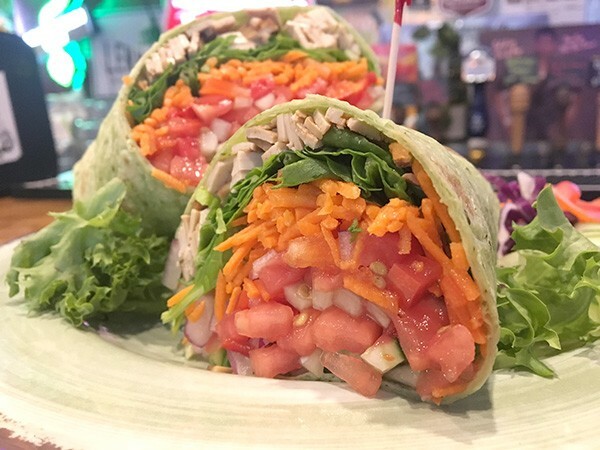 The Lowdown: Common Market owner Blake Barnes credits Bridget Wyant with bringing the vegan/vegetarian focus to the CM deli menu. From offering meatless brunch options to sandwiches such as the Tree Hugger and Mid-Eastern, Wyant was a trailblazer for Charlotte vegans and vegetarians. And her favorite sandwich is the Straight Jacket Soy, one of CM's first veggie items. The secret to the perfect Straight Jacket? "It goes best on a wrap with Veganaise." We don't disagree. Goes Down Well With: A large glass of suicide kombucha/juice (we recommend mixing the Green Apple juice with the Fire kombucha on tap). Maker(s): "We honestly can't remember where [the Straight Jacket Soy] came from, but I've been making it for 12 years," Wyant says. Hours: Mon.-Sat., 6:30 a.m.-6 p.m. (4 p.m. opn Monday); Sun., 8 a.m.-4 p.m. 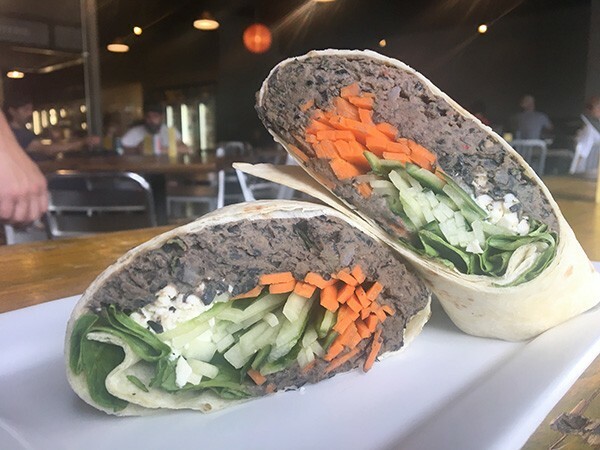 The Lowdown: This is your basic, garden variety (pardon the pun) veggie wrap: black beans (check), lettuce (check), cukes (check). It's hard to go wrong with these ingredients, and when you add to that the awesome creative atmosphere at Earl's Grocery near Central Piedmont Community College, you have one of the best veggie sandwiches in the city. Hours: Mon-Thurs., 8:30 a.m. - 8:30 p.m.; Fri.-Sat., 8:30 a.m. - 9 p.m.; Sun., 10:30 a.m.-3 p.m.
Fixins: House-made chicken salad, candied walnuts, bacon and maple syrup between two waffles. 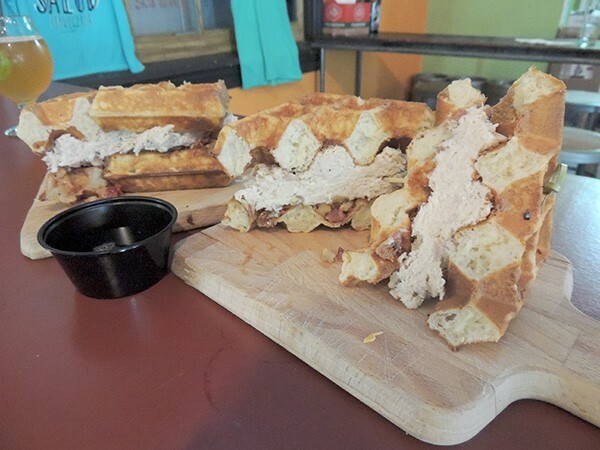 The Lowdown: Fud @ Salud is known for its specialty waffle-wiches both sweet (You're Killin Me S'mores) and savory (Jason Gi-ham-brie), but as popular as those aforementioned hybrids are, nothing touches the popularity of the chicken and waffles waffle-wich. They've sold 8,000 in less than two and a half years, serving up around 200 every week. "So many people assume that waffles are breakfast items," says Jeff McElwee, or the Fud Dud, as he's called. "And they also assume that waffles are super sweet by nature. But when you break down our recipe, it has 20 cups of flour and only two cups of sugar, so they're not inherently sweet by any means." Goes Down Well With: Any stout from the adjoining beer shop. Location: 3306 N. Davidson St. Hours: Mon.-Thu., 12-10 p.m.; Friday, 12 p.m.-12 a.m.; Sat., 11 a.m.-12 p.m.; Sun., 12-7 p.m. The Lowdown: Le's has witnessed major changes in its spot at Asian Corners Mall since 2004, but don't be fooled by the unassuming location, these are the best bánh mì sandwiches in town. It's been that way since it opened in another location in the early '90s. 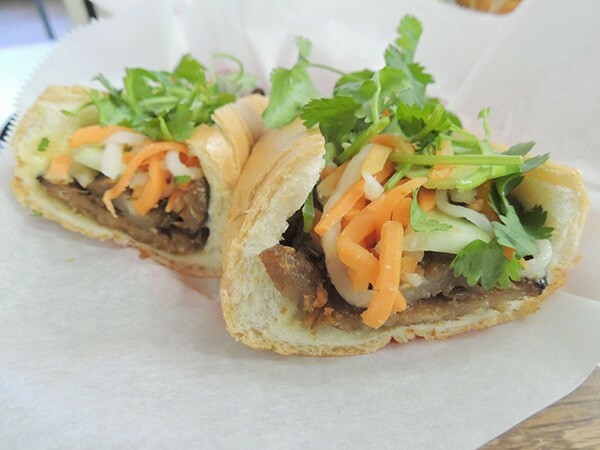 "Bánh mì was really new to Charlotte, so a lot of the American folks didn't know about it yet," says Tuan Nguyen, whose mother, Le, founded the restaurant. Since then, it's grown in popularity. "I think it's just the flavors," Tuan says. "Bánh mì is basically a contrast of flavors. You have the saltiness -- your savoriness -- from the meats, and then you get your sweetness from the carrots. That's what makes bánh mì special." Hours: Thurs.-Tues., 9 a.m.-5:30 p.m.; Closed Wednesdays. Fixins: Carolina pulled pork, mac 'n' cheese and bourbon onions. The Lowdown: You'll never see a grilled cheese sandwich the same way after savoring Papi's Mushroom Gruyere, with its delicious pan roasted wild shrooms, truffle spread, gruyere cheese and nutt fontina. But the most popular item on this menu is the Pig Mac, which, according to co-owner Brian Stockholm, "pretty much built this truck." Goes Down Well With: Homemade dill pickles and basil lemonade. 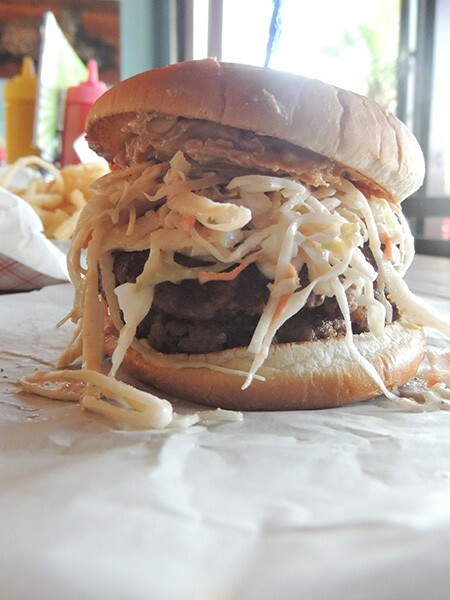 Hours: Tues.-Fri (lunch), 11 a.m.-2 p.m.; Friday (dinner), 5 p.m.-10 p.m.
Fixins: Beef patty (or patties), crunchy peanut butter, cilantro honey coleslaw, sriracha. The Lowdown: In the six years since Pinky Westside Grill sarted serving the Ding Dong, they've gotten plenty of reactions, says restaurant manager Lisa Clontz, but all she can say is, you've got to try it before you judge it. "I think that when most people hear about it, some people, they actually shudder, and they're like, 'What is this?' But the best way I find to describe it is, I call it pad thai on a sandwich." You can order any other sandwiches Ding Dong-style as well. People even make tacos with the Ding Dong ingredients, so go to town. Goes Down Well With: Skinny, shredded onion rings. Location: 1 600 W. Morehead St. 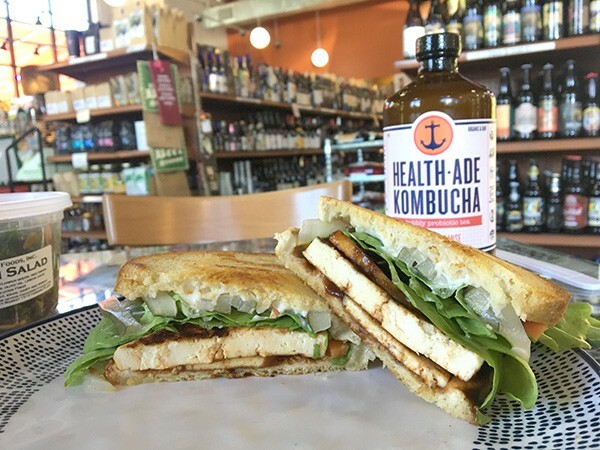 Hours: Mon.-Sat., 11 a.m.-11 p.m.; Sun., 11 a.m.-10 p.m.
Lowdown: Owner Rondelez swore he'd never serve tofu sandwiches, because he thought nobody ever really gets them right. But when his customers demanded them, Rondelez came up with a flavorful item that defies all tofu sandwiches you've ever had. You know how bland they can be? Not a problem with this tart combo of barbecue sauce, pickled veggies and Veganaisse. 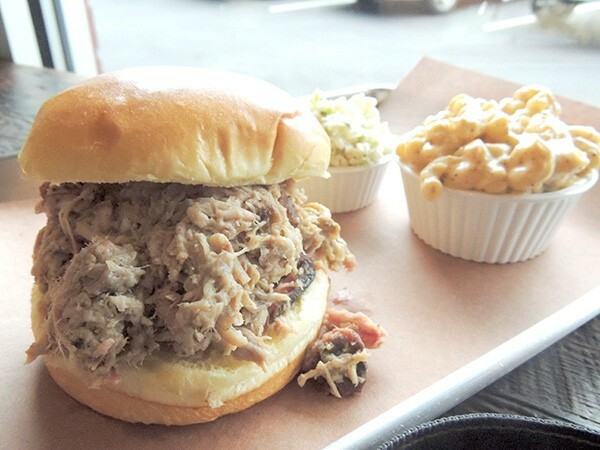 Hours: Mon.-Sat., 7 a.m.-9 p.m. (deli hours); Sun., 9 a.m.-9 p.m.
Fixins: Pork smoked for 15-18 hours then chopped on a wooden chopping board, choice of white or red slaw. The Lowdown: Pitmaster Gray Cole is quick to point out that he smokes his meat so long that trying to pull it would just make it all fall apart, so he doesn't have much choice but to chop it. Turns out, that's a tradition here in North Carolina, and the story behind it is a bit cringeworthy. 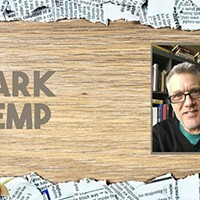 "Back in the day, people didn't have such good dentistry around here, so chopped pork was like a courtesy to your customers," Cole says. Whatever the reason, we'll take it -- and include some of that white "Octane" BBQ sauce made in house by a staffer. Goes Down Well With: Mac 'n' cheese with house-made sauce. Location: 228 West Blvd . Hours: Tues.-Sun., 11 a.m.-9 p.m.; Closed Mondays. The Lowdown: Ask Mr. Jones to add a little mayo and mustard, and you won't find a better, juicier, more flavorful veggie hoagie than than this -- and at an amazingly low price, to boot. 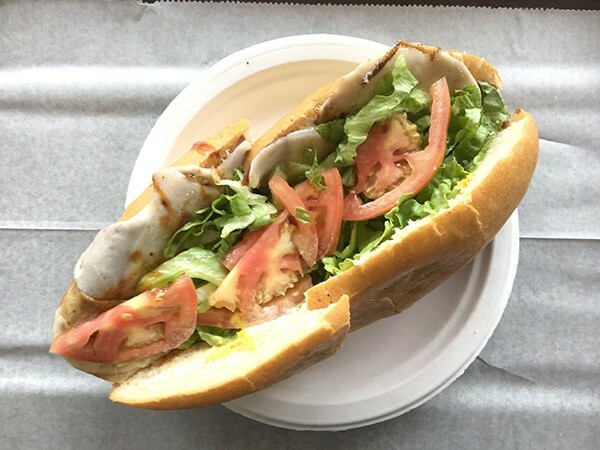 Locally owned Sub One is among Charlotte's best-kept secrets, but purist vegetarians beware of this sandwich: they cook that soy meat on the same grill with real meat, so if that's a deal breaker, move along. Meat eaters: There's tons of great choices here for you, too. Hours: Mon.-Fri., 11 a.m. - 7 p.m.; Sat., closed; Sun., 11 a.m. - 4 p.m.